Cesare Bonesana-Beccaria, Marquis of Gualdrasco and Villareggio (Italian: ; 15 March 1738 – 28 November 1794) was an Italian criminologist, jurist, philosopher, and politician, who is widely considered as the most talented jurist and one of the greatest thinkers of the Age of Enlightenment. Recognized to be one of the fathers of classical criminal theory and modern penology, he is well remembered for his treatise On Crimes and Punishments (1764), which condemned torture and the death penalty, and was a founding work in the field of penology and the Classical School of criminology by promoting criminal justice. 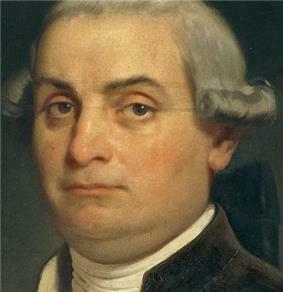 Cesare Beccaria's works had a profound influence on the Founding Fathers of the United States. Born in Milan on 15 March 1738, Beccaria received his early education in the Jesuit college at Parma. Subsequently, he graduated in law from the University of Pavia in 1758. In his mid-twenties, Beccaria became close friends with Pietro and Alessandro Verri, two brothers who formed an intellectual circle called "the academy of fists" which focused on reforming the criminal justice system. Through this group Beccaria became acquainted with French and British political philosophers, such as Hobbes, Diderot, Helvetius, Montesquieu, and Hume. At the encouragement of Pietro, Beccaria wrote On Crimes and Punishments (1764). Some background information was provided by Pietro, who was in the process of authoring a text on the history of torture, and Alessandro was an official at a Milan prison had first hand experience of the prison's appalling conditions. The brief work relentlessly protests against torture to obtain confessions, secret accusations, the arbitrary discretionary power of judges, the inconsistency and inequality of sentencing, using personal connections to get a lighter sentence, and the use of capital punishment for serious and even minor offenses. Almost immediately, the work was translated into French and English and went through several editions. Legal scholars of the time hailed it, and several European emperors vowed to follow it. With great hesitation, Beccaria acted on an invitation to Paris to meet the great thinkers of the day. A chronically shy person, Beccaria made a poor impression at Paris and returned to Milan after three weeks. Beccaria continued to gain official recognition and held several nominal political positions in Italy. Separated from the invaluable input from his friends, though, he failed to produce another text of equal importance. Outside Italy, an unfounded myth grew that Beccaria's literary silence owed to Austrian restrictions on free expression in Italy. At first he showed a great aptitude for mathematics, but studying Montesquieu (1689-1755) redirected his attention towards economics. In 1762 his first publication, a tract on the disorder of the currency in the Milanese states, included a proposal for its remedy. During this time, Beccaria, with the brothers Pietro and Alessandro Verri and a number of other young men from the Milan aristocracy, formed a literary society named "L'Accademia dei pugni" (the Academy of Fists), a playful name which made fun of the stuffy academies that proliferated in Italy and also hinted that relaxed conversations which took place in there sometimes ended in affrays. He was influenced by Helvétius. Editions of Beccaria's text follow two distinct arrangements of the material: that by Beccaria himself, and that by French translator Andre Morellet (1765) who imposed a more systematic order to Beccaria's original text. Beccaria opens his work describing the great need for reform in the criminal justice system, and he observes how few studies there are on the subject of such reform. 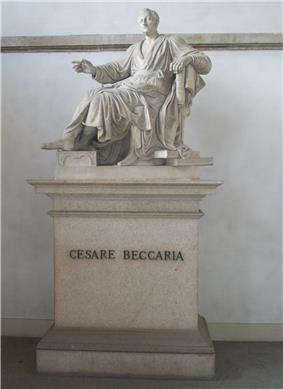 Throughout his work, Beccaria develops his position by appealing to two key philosophical theories: social contract and utility. Concerning the social contract, Beccaria argues that punishment is justified only to defend the social contract and to ensure that everyone will be motivated to abide by it. Concerning utility (perhaps influenced by Helvetius), Beccaria argues that the method of punishment selected should be that which serves the greatest public good. Contemporary political philosophers distinguish between two principle theories of justifying punishment. First, the retributive approach maintains that punishment should be equal to the harm done, either literally an eye for an eye, or more figuratively which allows for alternative forms of compensation. The retributive approach tends to be retaliatory and vengeance-oriented. The second approach is utilitarian which maintains that punishment should increase the total amount of happiness in the world. This often involves punishment as a means of reforming the criminal, incapacitating him from repeating his crime, and deterring others. Beccaria clearly takes a utilitarian stance. For Beccaria, the purpose of punishment is to create a better society, not revenge. Punishment serves to deter others from committing crimes, and to prevent the criminal from repeating his crime. Beccaria argues that Punishment should be swift since this has the greatest deterrence value. He defends his view about the swiftness of punishment by appealing to the theory of the association of ideas (developed most notably by David Hume and David Hartley). According to associationists, if we know the rules by which the mind connects together two different ideas (such as the ideas of crime and punishment), then we can strengthen their association. For Beccaria when a punishment quickly follows a crime, then the two ideas of "crime" and "punishment" will be more quickly associated in a person's mind. Also, the link between a crime and a punishment is stronger if the punishment is somehow related to the crime. Given the fact that the swiftness of punishment has the greatest impact on deterring others, Beccaria argues that there is no justification for severe punishments. In time we will naturally grow accustomed to increases in severity of punishment, and, thus, the initial increase in severity will lose its effect. There are limits both to how much torment we can endure, and also how much we can inflict. As Beccaria’s ideas were critical of the legal system in place at the time, and were therefore likely to stir controversy, he chose to publish the essay anonymously -- for fear of government backlash. In actuality, the treatise was extremely well-received. Catherine the Great publicly endorsed it, while thousands of miles away in the United States, founding fathers Thomas Jefferson and John Adams quoted it. Once it was clear that the government approved of his essay, Beccaria republished it, this time crediting himself as the author. Three tenets served as the basis of Beccaria’s theories on criminal justice: free will, rational manner, and manipulability. According to Beccaria -- and most classical theorists -- free will enables people to make choices. Beccaria believed that people have a rational manner and apply it toward making choices that will help them achieve their own personal gratification. 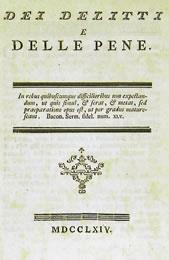 In 1764 Beccaria published a brief but justly celebrated treatise On Crimes and Punishments, which marked the high point of the Milan Enlightenment. In it, Beccaria put forth some of the first modern arguments against the death penalty. His treatise was also the first full work of penology, advocating reform of the criminal law system. The book was the first full-scale work to tackle criminal reform and to suggest that criminal justice should conform to rational principles. It is a less theoretical work than the writings of Hugo Grotius, Samuel von Pufendorf and other comparable thinkers, and as much a work of advocacy as of theory. In this essay, Beccaria reflected the convictions of the Il Caffè group, who sought to cause reform through Enlightenment discourse. In 1771, Beccaria was made a member of the supreme economic council, and in 1791 he was appointed to the board for the reform of the judicial code, where he made a valuable contribution. He died in Milan. Following his death, talk of Beccaria spread to France and England. People speculated as to whether Beccaria’s lack of recent writing on criminal justice was evidence that he had been silenced by the British government. In fact, Beccaria, prone to periodic bouts of depression and misanthropy, had grown silent on his own. A forerunner in criminology, his influence during his lifetime extended to shaping the rights listed in the U.S. Constitution and the Bill of Rights. "On Crimes and Punishments" served as a guide to the founding fathers. Beccaria’s theories, as expressed in his treatise "On Crimes and Punishments," have continued to play a great role in recent times. Current policies impacted by his theories include, but are not limited to, truth in sentencing, swift punishment and the abolishment of the death penalty in some U.S. states. While many of Beccaria’s theories are popular, some are still a source of heated controversy, even more than two centuries after the famed criminologist’s death. His grandson was Alessandro Manzoni, the noted Italian novelist and poet who wrote, among other things, The Betrothed, one of the first Italian historical novels, and "Il 5 Maggio", a poem on Napoleon's death.